Rolling out a multi-site computerized maintenance management system (CMMS) across your organization can have huge benefits, from standardized processes to real-time dashboard metrics across the whole business. But which location should you set up first? It’s not just a matter of picking a site and forging ahead—there are several factors to consider to ensure your CMMS is rolled out as efficiently and effectively as possible. 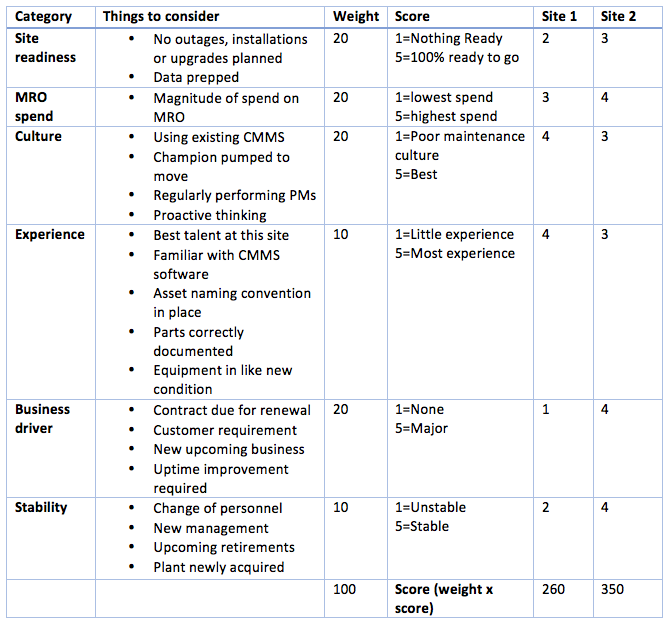 Below, we’ve used a scoring matrix to determine the order of operations when implementing a multi-site CMMS across multiple locations. Using this approach will help eliminate a lot of the confusion around choosing your first site (and it’ll give you a solid answer when asked, “Why did you pick that site first?”). Does the site have the available resources to assist with the CMMS implementation, and if so, do they have the expertise and know-how? Do they have a CMMS champion? Do they have any major events planned such as major shutdowns, installs or overhauls? Is their data ready? How big of an impact is the CMMS going to have to the organization’s bottom line? If you expect the CMMS to save the organization 5% a year on spare parts, then the site with most spare parts gets scored higher. Are the maintenance folks at the site already using CMMS? If so, are they satisfied with the current system? How will the CMMS be received on the production floor? Do they believe in proactive maintenance? Do they embrace new technology? This one is pretty straightforward: You have a higher chance of a successful setup with an experienced team, so it makes sense to start with the site that has a solid amount of experience. Is there an underlying business driver that could accelerate the implementation at one site over others such as contract renewal, audit and compliance, or additional volume? Is the site going through a big transition such as a change in personnel? If so, it’s best not to introduce a wrench into the works. 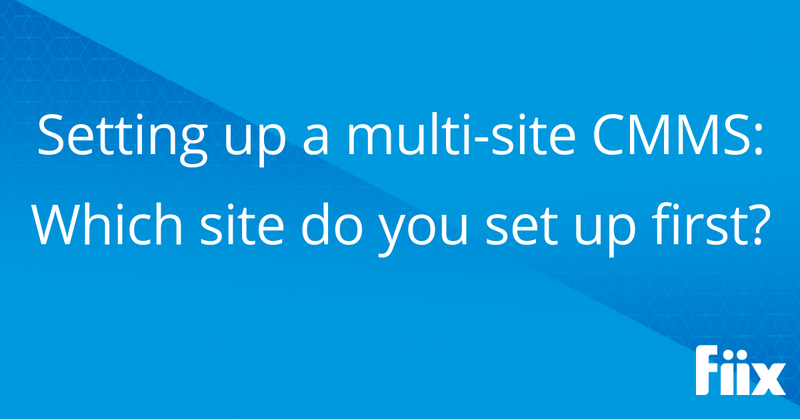 Instead, choose a site that is more stable to undertake the transition. In this case, site 2 clearly comes out on top and would be the first implementation for the CMMS. 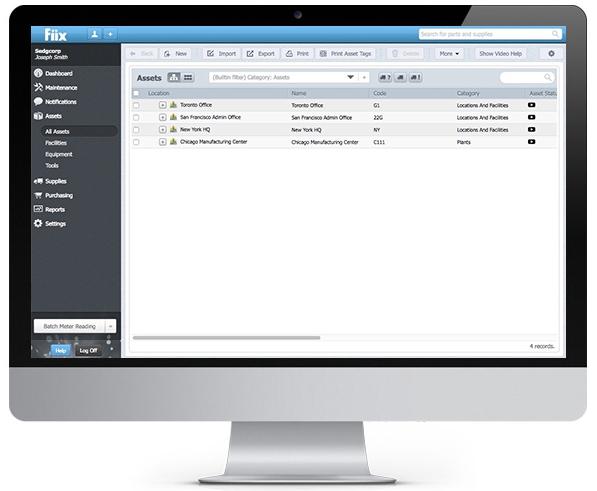 Did you know the new Fiix dashboard lets you see multi-site metrics on a single dashboard?